Online dating is that type of dating where you meet people that come from different background, ages, races, religion, and even geographical location. It allows for contact and communication with different people on the internet, the intention of most people are usually with the objective of developing a personal, romantic, or sexual relationship. The answer to the question being raised in the post title are going to be highlighted below and again people want to be in relationship and they don’t want to go through the olden days life & style of starting a relationship, everyone want the easy way out. 1. Online dating is a comfortable place to start dating and relationship, nobody is watching you, you can decide to dress up, be in any way you feel comfortable for yourself, no need to spend money for hosting and it is so economical. 2. In online dating things remain secret although there is nothing secret under the heaven but a very high level of secrecy can still be guarantee here. You don’t need to meet in person, you send romantic messages, chat and do all sort of thing you will not want to do publicly. 3. It is a starting place where you want to know the people your meeting and know him or her a little bit before the normal date will begin. 4. There are many who like to keep their sexuality secret. Such people will turn to online dating because it gives an advantage of being able to stop whenever you want, therefore, ensures that your identity has been protected while dating. It would be their choice if they want to meet someone they are dating online or would like to continue as it is. Online dating has enabled several people to socialize online more than they would get to before. People having difficulty in interacting with others or with their dates can do so without inhibitions online. 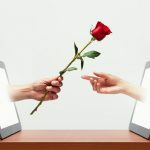 However, online dating cannot override the regular form of dating, though the online dating sites offer enough ways to express feelings, there is no alternative to feelings expressed by touch and actual presence of a person. So, no matter how long your online dating takes, you must come back to the reality of being together physically. Go online and have your fun and turn it to the ultimate relationship you’ve been looking for. I am now online for several hours, searching this type of articles, at last I found your articles. I think online dating is now the best, cheap and easiest way to find a date. thank you so much for shearing your thought.